Delphos Jefferson’s Josh Wiseman pitches against Perry during Wednesday’s game in Delphos. 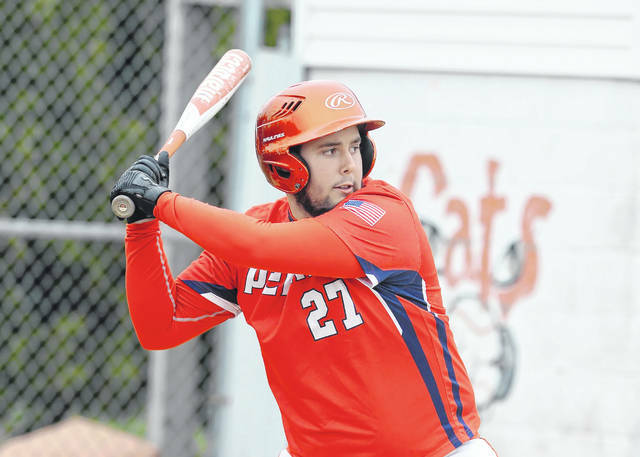 Perry’s Cameron Patrick at bat against Delphos Jefferson during Wednesday’s game in Delphos. Perry’s Louis Hoersten pitches against Delphos Jefferson during Wednesday’s game in Delphos. 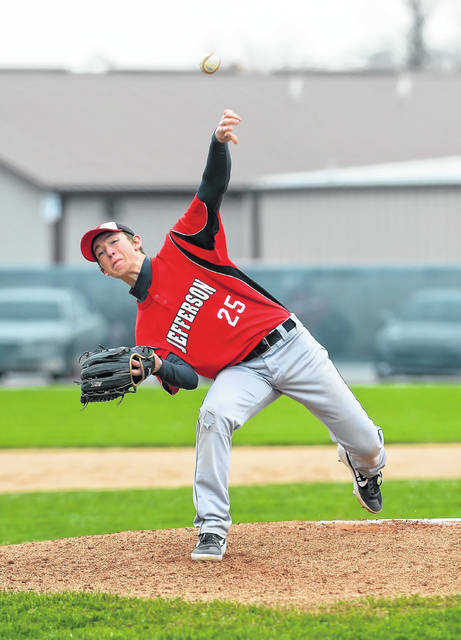 DELPHOS – Delphos Jefferson’s baseball team rode the pitching of starter Josh Wiseman and reliever Eli Lucas to a 6-1 non-league victory over Perry on a cold and windy Wednesday night. With the wind blowing in at Wildcat Field, Wiseman, a southpaw, threw five innings of three-hit shutout ball. He walked two and struck out three in his 74-pitch (44 for strikes) effort. Lucas mopped up with two innings in ceding a hit, a walk and an earned run. He struck out two. Perry head coach Mark Hoersten gave credit where credit was due. Perry had a great chance in the top of the second inning as Logan Liles singled to right center and Camron Patrick walked. However, Wiseman fanned the next two batters and induced Joe Hoersten to pop out in starting a string of 11 straight outs. The Wildcats got all the runs they needed with a 3 spot in the bottom of the third inning against Commodore starter Louie Hoersten, all with two outs. Darnell Simpson got their first hit of the game with a single to left, stole second base and took third on a wild pitch before scoring on a line single to left by Roy Almonte (1-for-1, 2 walks). Almonte reached third on an error on a fly ball hit by Conner Anspach and both scored on a double to right center by Darius Shurelds for that 3-0 edge. Jefferson doubled its score with a 3-run bottom of the fifth frame against Perry left-handed reliever Logan Liles. Almonte walked and Anspach was hit by a pitch. Shurelds forced Almonte at third but a throwing error on the relay put Anspach on third and Shurelds on second, with Anspach eventually stealing home. An out later, J.T. Taviano walked. A throwing error on a Jacob Simmons grounder plated Shurelds and put Taviano at third, from where he scored on a wild pitch for a 6-0 edge. “We did what we needed to do today offensively,” Geary said. “We kind of put it together today with good pitching, good defense and getting enough done offensively. This is the type of game you can build on as you on into the season deeper. Perry got its lone run in the top of the sixth as Cole Boroff walked against Lucas and reached second on a wild pitch. Keaton Miller was hit by a pitch and both moved up on a wild pitch. An out later, Liles flied out to left to score Cole for that 6-1 deficit. 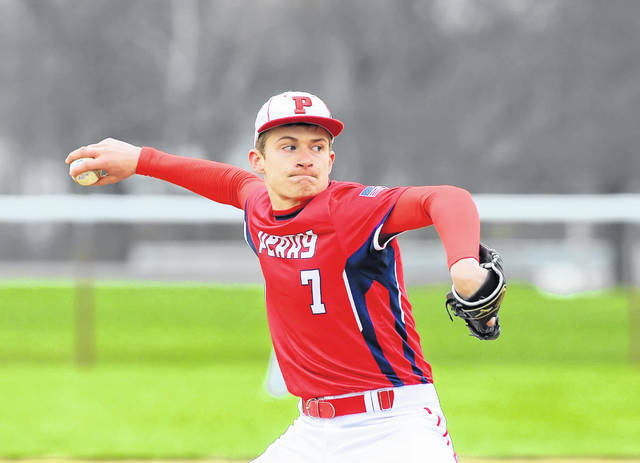 https://www.limaohio.com/wp-content/uploads/sites/54/2019/04/web1_Perry-vs-DJ-005.jpgDelphos Jefferson’s Josh Wiseman pitches against Perry during Wednesday’s game in Delphos. https://www.limaohio.com/wp-content/uploads/sites/54/2019/04/web1_Perry-vs-DJ-003.jpgPerry’s Cameron Patrick at bat against Delphos Jefferson during Wednesday’s game in Delphos. https://www.limaohio.com/wp-content/uploads/sites/54/2019/04/web1_Perry-vs-DJ-002.jpgPerry’s Louis Hoersten pitches against Delphos Jefferson during Wednesday’s game in Delphos.